Ekushey. International Mother Language day. Got up really early and joined the throngs of people marching through the university to the language martyrs’ monument; the Shaheed Minar. Was feeling really fluey but didn’t want to miss seeing this.Had no idea how many people would be involved. All the roads around the university area were blocked to traffic, so for once, to wander through Dhaka streets was realitively peaceful. Especially so early in the morning; sunrise. 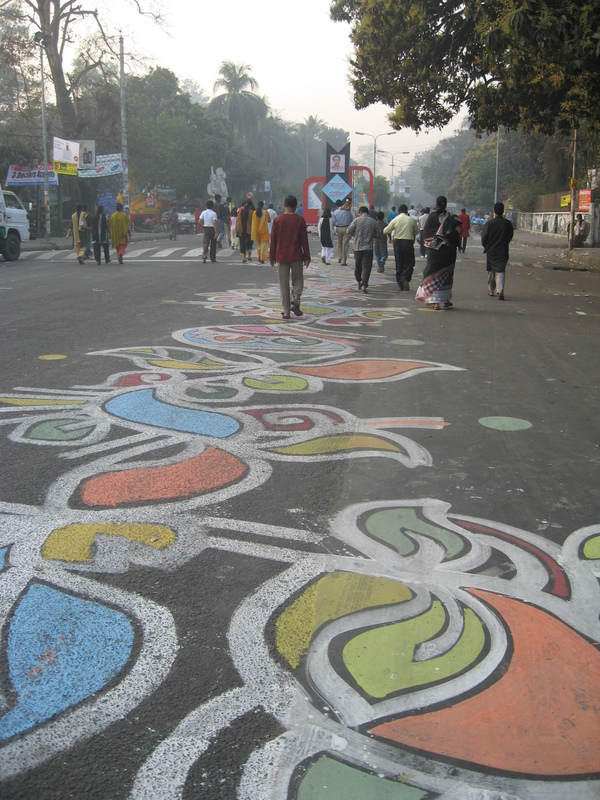 The streets were painted with coloured alpana and the atmosphere was wonderful as more and more people started to join the procession. At one point it was actually quite frightening as there were so many people being forced through narrow barricades. Most people carried flowers to lay at the monument. There were lots of groups of people marching behind banners and carrying huge circular wreaths of orange and yellow flowers. 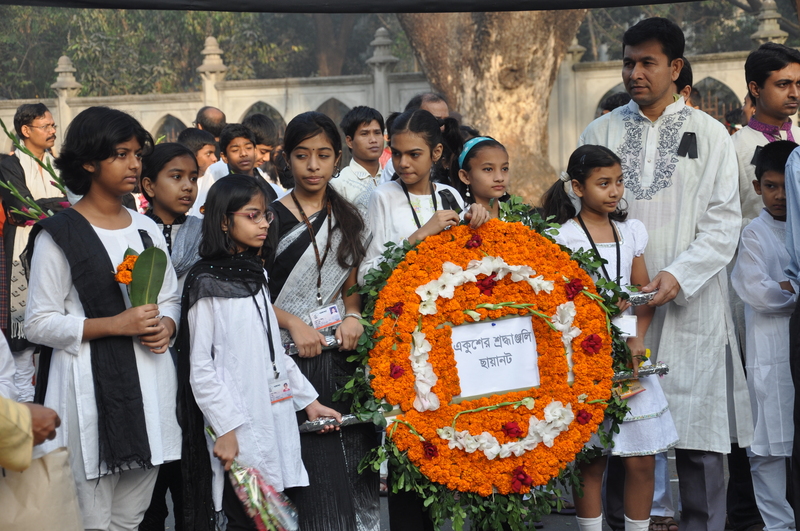 The traditional dress for the day is black, grey and white; sombre colours of mourning. People were very friendly, inviting us to join behind their groups etc. The closer we got to the Minar, the louder the chanting became from loudspeakers attached to light posts. Repetitive, dirge like music, much like our hymns I suppose, which people started to sing along to. It really did feel amazing to be part of the crowd. It took about 2 hours to progress to the Minar, moving very slowly and passing through various security/bomb checks. Was sad for local people who really were only allowed to lay their flowers quite far below the monument and had to move on. As foreigners (helped by Steven’s big camera) we were escorted behind the barricades and had the wonderful opportunity of watching the flower arrangers decorate the alpana. This was definately the most spectacular part of the experience. 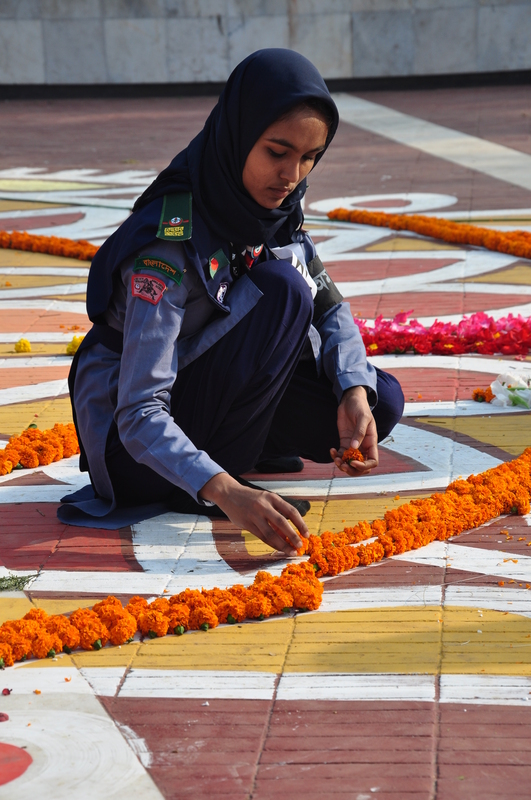 Hundreds of groups of young people (soldiers, guides etc) were collecting the wreaths, taking them apart and laying the individual flowers into intricately complex patterns over an area the size of 2 football pitches. They were so focused and structured in their work it seemed to fill up quite quickly. There was something quite special about the time and care they were taking over something that would fade in a few hours in the heat. The monument itself is exactly like one I have seen in a memorial park in Whitechapel. We stayed for half an hour of so, watching the ceremony (and being interviewed, photographed as usual), then joined the crowds walking back. By now a very festive atmosphere, with flag sellers, little food stalls on wheels, women selling brightly coloured bangles and children’s toys. The colours of the flowers at the monument are what will remain in my head from this day. Great to see this commemoration. Language not only unites Bangladesh but is a bridge to Bangla-speaking regions of neighbouring India. This is one of the world’s great literary languages, and spoken by many more people than, for example, German. This is little-understood in the West, where the emphasis is always on Hindi-Urdu when South Asian languages are considered.